MILWAUKEE — Clayton Kershaw pounded his glove over and over, yelling "Let's go!" as he walked off the mound. "Got to do a better of keeping the score close for our guys to have a chance there at the end," Kershaw said. 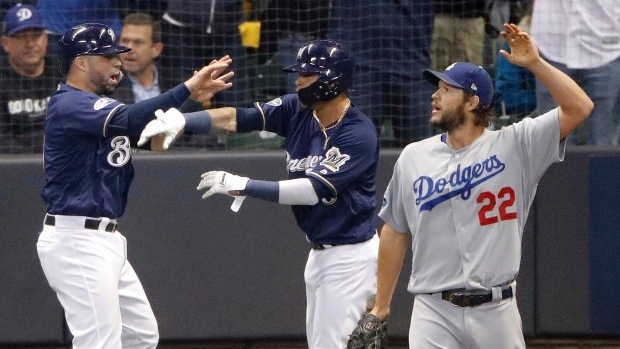 Los Angeles committed four errors, including two by catcher Yasmani Grandal in Milwaukee's two-run third inning. But another playoff flop for its ace left-hander might be its biggest concern as it tries to cool off streaking Milwaukee. "He's been in the playoffs for a really long time," Grandal said. "He knows what he needs to do to win games and that's all that matters. Game 5 comes around, then he'll be the guy on the mound and he'll be the guy who will get us a win." Kershaw holds the team records for playoff wins (eight), starts (21), innings (133) and strikeouts (144), but is just 8-8 with a 4.26 ERA in 26 career post-season appearances. The Dodgers dropped to 13-13 when the three-time NL Cy Young Award winner takes the mound in the playoffs. "It was a tough one," he said. "Obviously you don't want to get your team off to that start." The night started to get away from Kershaw and the Dodgers when Brandon Woodruff led off the third inning with a massive drive to right-centre , becoming the third reliever in major league history to homer in a post-season game. It was the first time in post-season history that a lefty-batting pitcher went deep off a left-hander. Woodruff joined the Cubs' Travis Wood (2016 NLDS) and the New York Giants' Rosy Ryan (1924 World Series) as relievers to homer in the post-season. A passed ball and an interference call on Grandal helped set up Hernan Perez's sacrifice fly. Kershaw minimized the damage by striking out Mike Moustakas, stranding two runners in scoring position and leading to his emotional display as he headed toward the dugout. "We gave up too many bases. We didn't play clean when he was in the game," manager Dave Roberts said. "The errors affected the game. But as far as Clayton, I just think it was poor execution. And I thought the stuff was good, but he just made mistakes in the strike zone and defensively, again, we didn't do him any favours."